It appears that the D70 has good infrared capabilities. 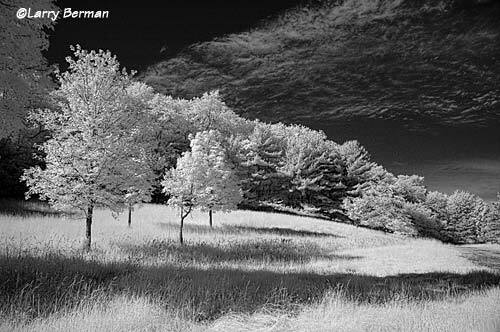 The before picture was taken with the CoolPix 8700 and the subsequent infrared pictures taken with the D70. The kit 18-70 zoom lens has a 67mm filter size. I picked up a 67-72 adapter to use all my existing 72mm filters. The infrared photos were taken with an 88A filter. Exposure was set on Manual and the LCD was used to verify the integrity of the exposure. I did bracket manually in shutter speed and chose the images with detail in the highlights. 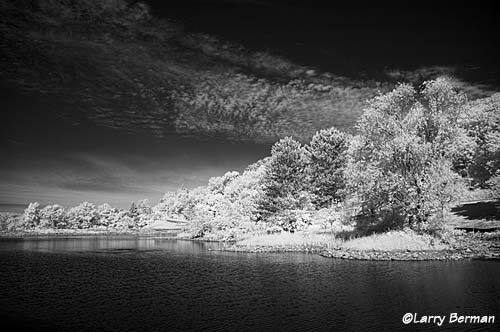 The problem with using a DSLR for infrared is that the LCD doesn't become active until after the picture is taken. That means the camera has to be mounted on a tripod and the composition arranged before the infrared filter is screwed onto the lens. I picked up the 10.5mm fisheye and will be experimenting with it to shoot infrared. There is a rear gel filter slot in the lens. That means it will be a hassle to set up the composition, take the lens off to insert the gel filter and remount the lens again. I'll also need back up gel filters as the constant handling might damage it. Additionally, since the best time to shoot infrared is during strong sunlight, the image on the LCD is difficult to see, hence the need for an LCD hood, like the Xtend-A-View.